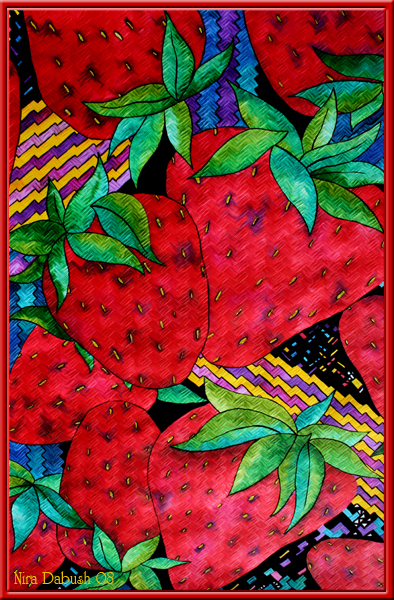 Strawberries Fields Forever. Mixed Media . 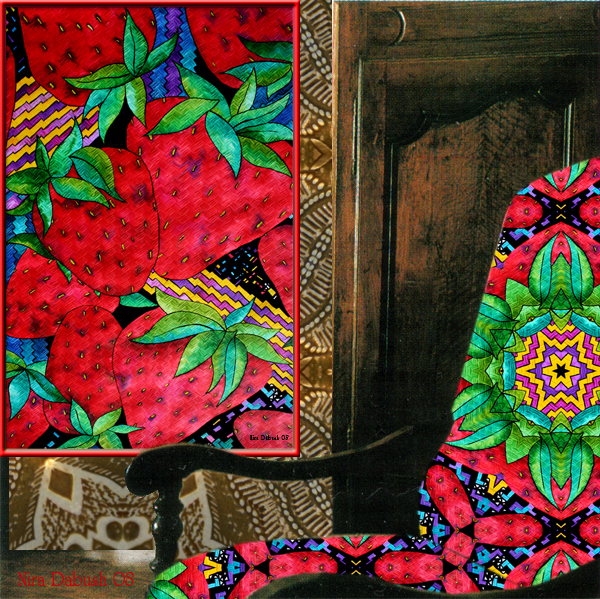 Presentation of my painting : " Strawberries Fields Forever ", near an armchair upholstered with my textile deisgn. The upper work meant as a contemporary painting, though may be used as textile design as well : In this scale, but also in much smaller scale, according to purpose. This artwork is dedicated to my home town, Ramat - Hasharon. The strawberries became a symbol of Ramat- Hasharon, since there used to be strawberries fields at the entrance of Ramat- Hasharon, tsomet Rishonim area ( at Rishonim junction ). I remember in 1987/8, the year I moved to Ramat- Hasharon still living with my parents and a student. I used to walk with those huge Poligal bags of ART, and another HEAVY bag contain all kinds of artist tools, to that bus station at the Rishonim junction. towards me, with the hugest most beautiful Red strawberry in his hand, a smile on his face.... Offering it to me :-) " Please take and eat " ... he said to me. Well , first I was surprised a bit shy... :-) YET, it was such a strawberry, that only can make you SMILE... Of - course I also thought about what will happen to my lipstick, while eating the strawberry, that it might damage the look of me... LOL ! After a very short hesitation, a bit embarrassed, of- course I took the strawberry and ate it, while smiling.